If you have an easily-repeatable way to wound your Gugs and a way to make it Day, this can be useful. But aside from Khopesh, I can't think of an easily-exploitable way to smack your Gugs around, and without that, the difference between Toughness +3 and +4 is pretty negligible. You aren't going to be losing Combat struggles in a Gug deck very often, given that most of them have 2 or more Combat icons. This also has the ever-awkward Dreamlands trait, which is as usual, either absolutely necessary or completely irrelevant. 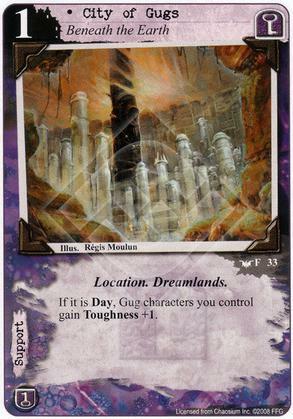 I have a feeling Dreamlands cards will be played a lot over the next few months so that Subtype is very relevant. However the toughness isn't great given the Gugs are already tough enough - willpower or "cannot be sacrificed" or some such thing would be more necessary. And Gugs are expensive anyway. Plus the day restriction. I'm daydreaming about building an agency yog gug deck that uses catastrophic explosion to clear the board so that only the gug's remain, with basilica to provide the day and willpower. We know at least one gug is in the next box so let's hope this card becomes more relevant. Sacrificial offerings is fun too! "Choose your gug effect"